This post could quite easily be titled “Yummy things made from bits and pieces in the fridge” but it doesn’t have quite the same ring to it. 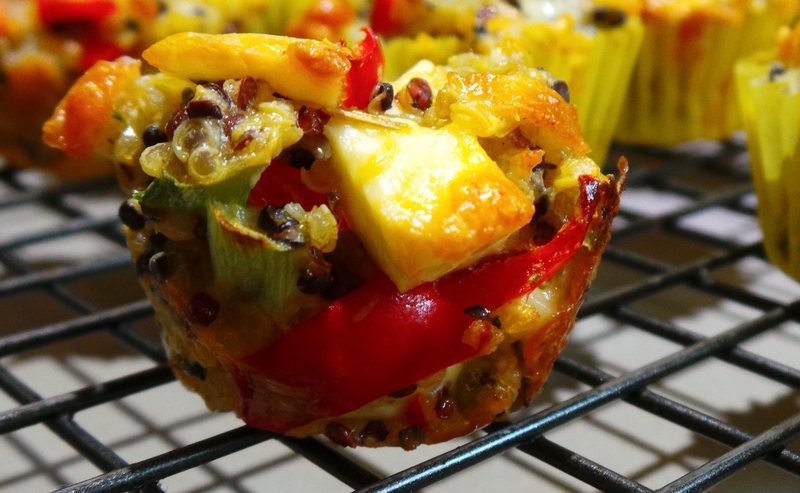 I came up with this recipe to use a heap of bits that were cluttering up my refrigerator. 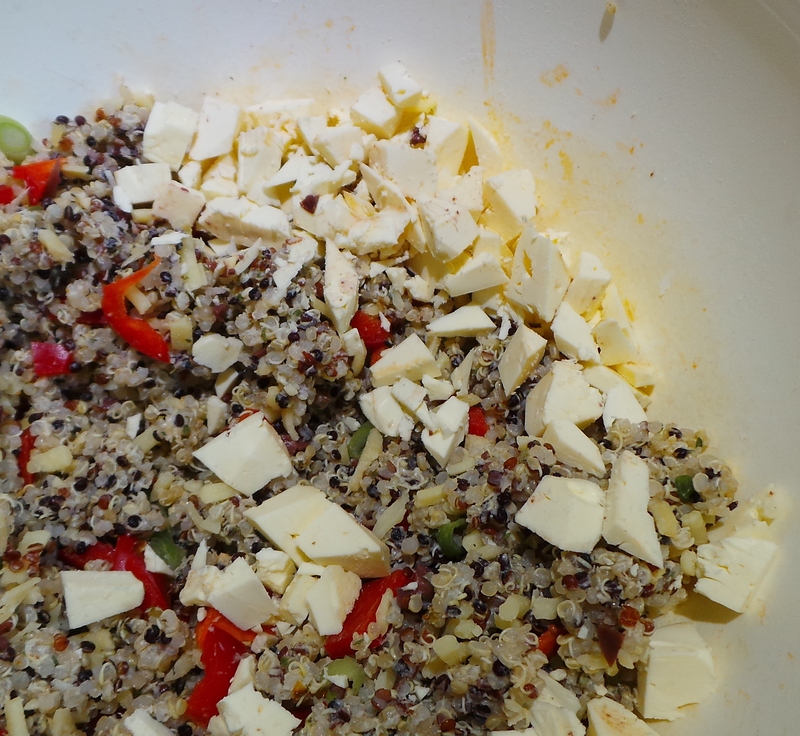 I had some tri-colour quinoa that was left over from something else, a bit of feta cheese that needed using, a handful (literally) of shredded mozzarella and half a red capsicum that also needed to be used. It’s also turned stinking hot here again, after a week of almost chilly weather, and I consider finger food to be the way to go at times like these. Finger food in this house means something more-ish, but not junky. 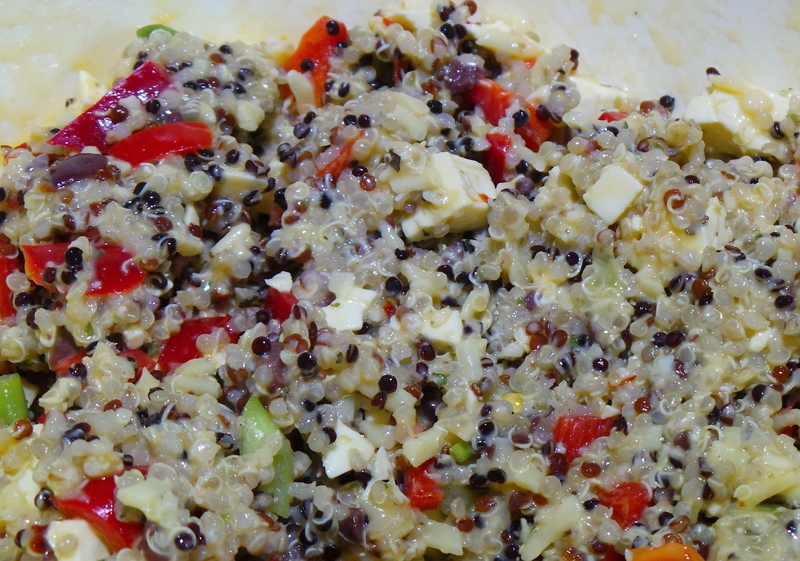 Quinoa can really be quite pretty. So, I started off with the leftover quinoa. The amount turned out to be two cups worth (which is going to look a whole lot more professional in a recipe), so that’s what I used. 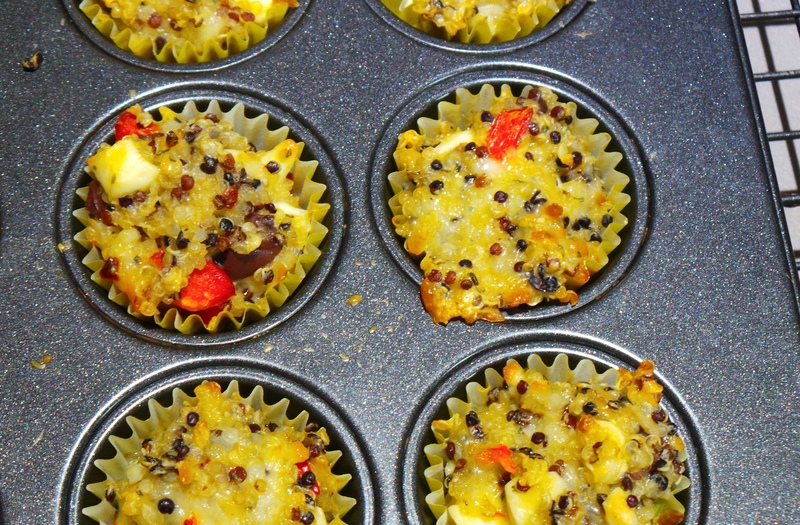 If you’ve not cooked quinoa before, you’ll find instructions here. 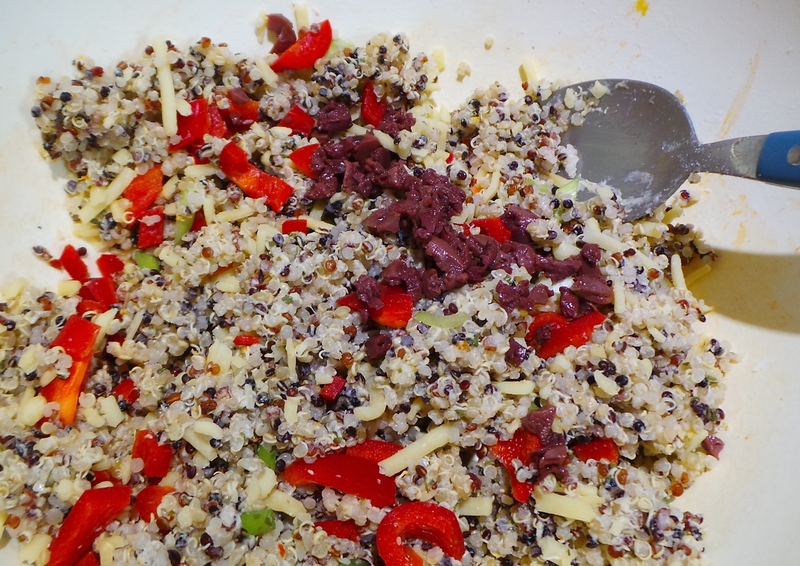 If you don’t have quinoa then cooked rice of any colour or description would also work. 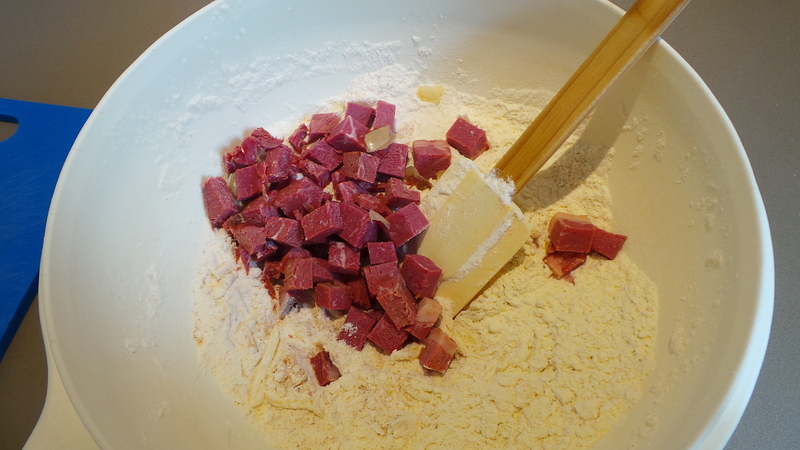 I popped it into a medium sized bowl and stirred in a couple of tablespoons of plain flour to help bind it together (it also gave me time to think about what to do next). If you have a celiac in your family then gluten-free flour will work too. I’d decided that I wanted to make it a Mediterranean flavoured …whatever… so I added a tablespoonful of an Italian Mixed Herb blend that I had and a teaspoon of minced garlic. From a jar. Sue me. That was all mixed through quite thoroughly, then the red capsicum was diced and added. I was glad it was in there when I saw the finished products as it gave a pop of colour to something that might have been too beige. Moving on. I also had one spring (green) onion so I sliced it up and added it too. Why not? Next the Mozzarella went in and I contemplated the feta. I’m not a fan of feta, but The Boy loves it. However, I adore black olives, so I pitted and minced three of those and stirred them through. Then the feta cheese. I didn’t weigh it, sorry, but I’d say I had about 3/4 of a cup when it was chopped up. That was mixed through too. The Feta Cheese was next to be deployed. I thought that looked like a rather tasty little mix and stopped adding stuff. If you are a hard-core carnivore, some diced ham or bacon would be a tasty addition too. You’re welcome. Now, in between all the dicing and mixing I had decided to make something to bake, so at this point I turned the oven on and started gazing soulfully at my baking trays. They were found but I didn’t have quite enough, so I just sprayed the empty cups with oil. The quinoa still needed something to bind it a little more, so I whisked up 2 eggs and mixed them through. 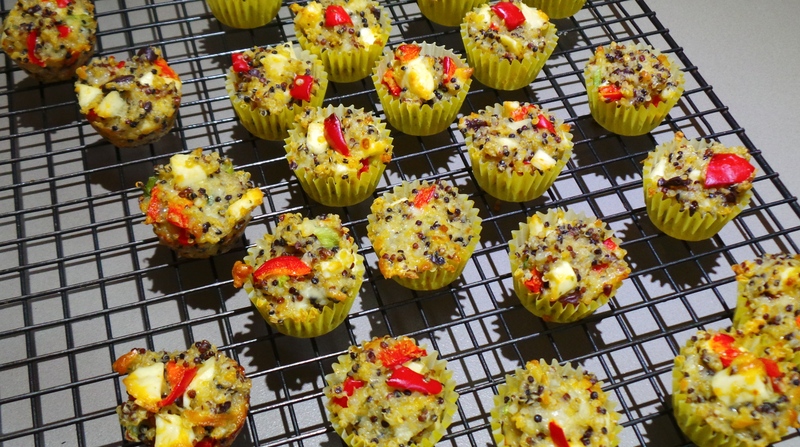 Then I filled each cup with about 2 teaspoons full of the quinoa mixture, making sure that a piece of the capsicum could be seen on the top of each cup – because pretty. 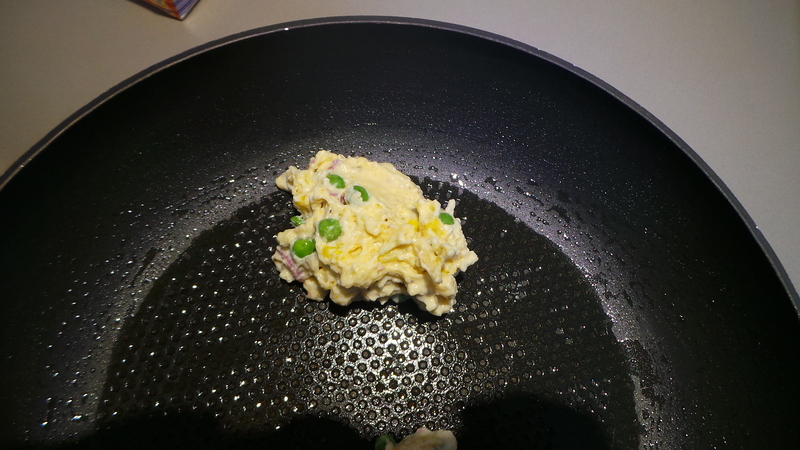 Mix in a couple of eggs. 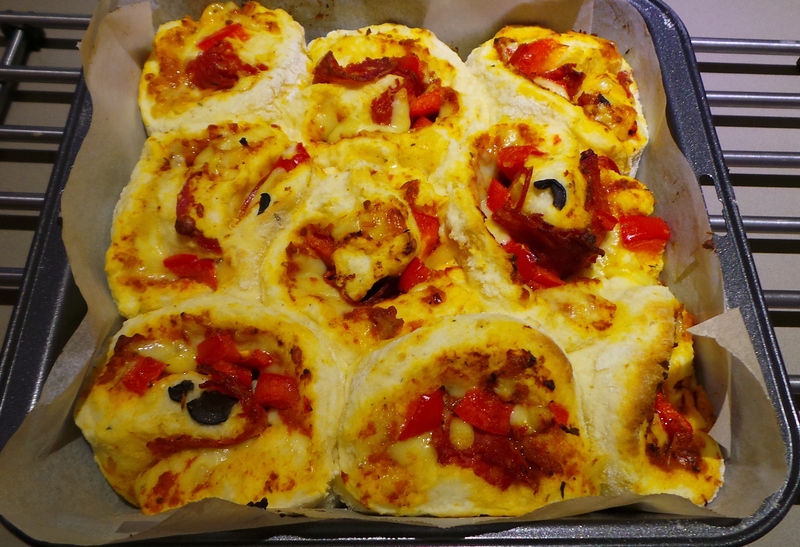 Then the tray was placed in the oven for 20 mins, until the morsels smelled amazing and the cheese was starting to brown. The Boy followed his nose into the kitchen as they were being retrieved from the oven and I had to stand guard until they were cool enough to eat. These little mouthfuls of flavour will find their place in lunch boxes during the week, but they would be just as at home at a party or BBQ. They’ll keep in an airtight container in the refrigerator for 2-3 days, but try to bring them up to room temperature again before eating to allow the flavours to develop. Hint: Get the kids to help you make them and they’ll be more likely to eat them. ½ medium red capsicum (bell pepper), diced. Line a mini cupcake tray with paper cases or oil well. 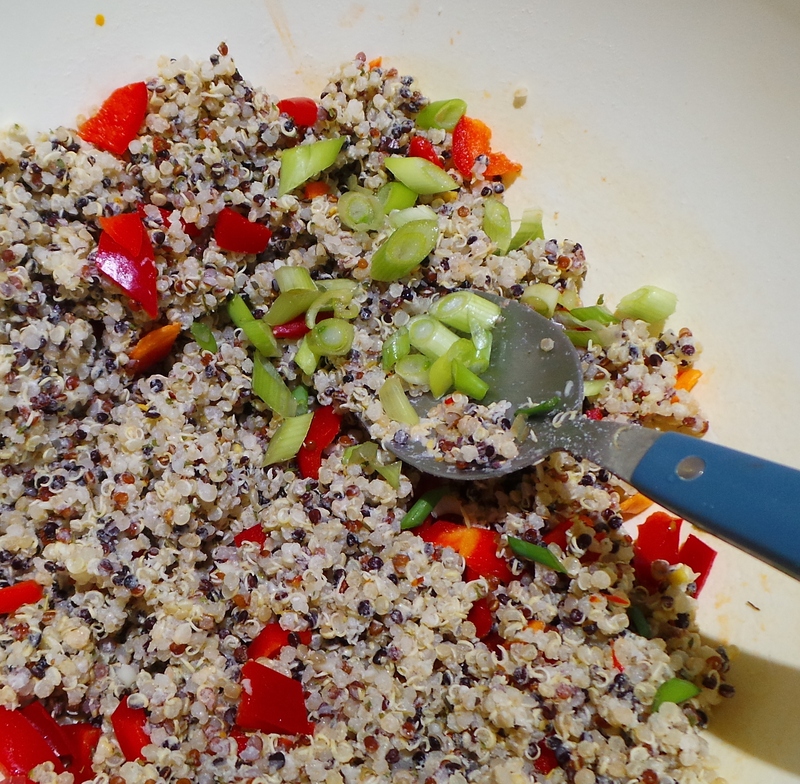 Place quinoa or rice in a medium-sized bowl and add the rest of the ingredients one at a time, stirring well between each. 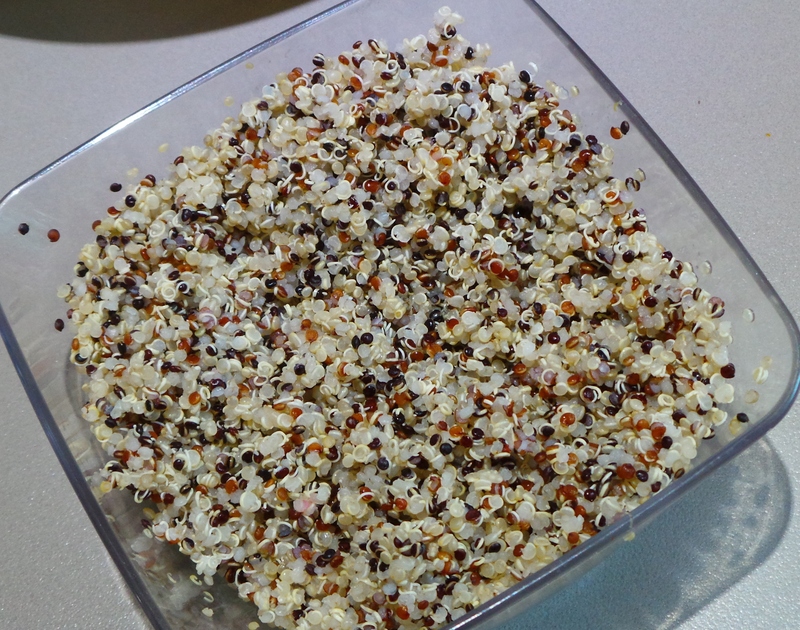 Fill paper cases with quinoa mix – about 2 rounded teaspoons per case. Allow to cool in the tray before removing to a cooling rack. Will keep in an airtight container in the refrigerator for 3-4 days. Like this? Follow us on Facebook or subscribe to receive updates by email. 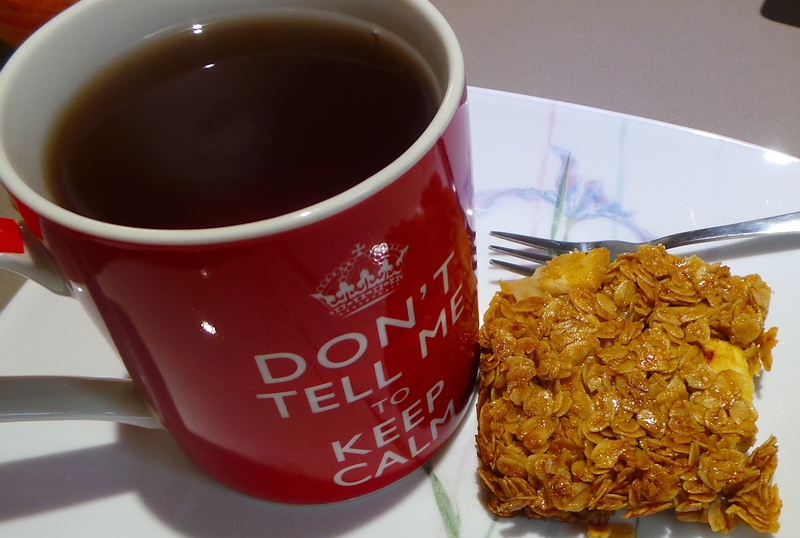 Last night, The Boy declared – out of the blue – that I should do a muesli (granola) bar recipe. Because school goes back next week or something and this could be useful to people. I think he just wanted muesli bars. I also think he could have told me before I did the fortnight’s shopping and could stock up on the expensive stuff that goes into these snacks. So, I compromised. I’m good at that. 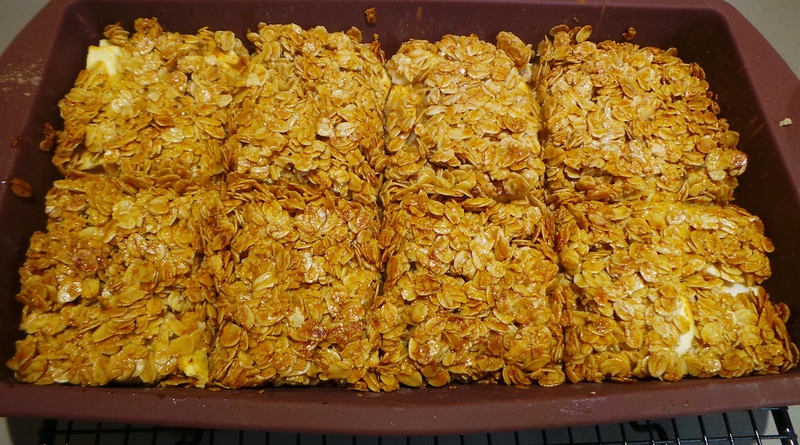 I made these little Apple and Oat Bars from stuff I already had and which – most likely – you already have too. Because that is how we roll in the Budget Bounty kitchen. It’s a recipe that literally takes only minutes to put together and which you could quite easily do with smaller versions of yourself HELPING. Ahem. You will need some butter, some honey, some brown sugar, some rolled oats and an apple or two. Also a bowl, a baking tin and a microwave proof jug and spatula. Sound complicated? Heat them for 1 minute at a time at 80% power until the butter is melted. You can do this in a saucepan on the stove, if you wish. 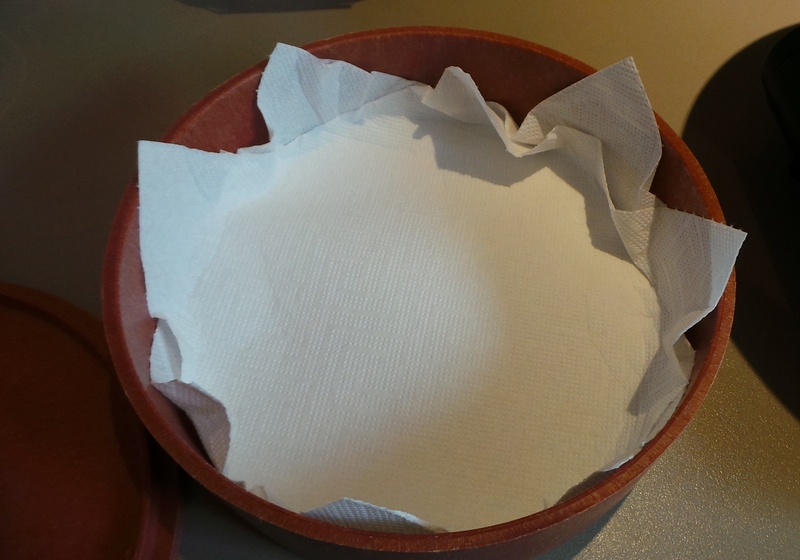 While it is melting, measure the oats into a medium sized mixing bowl and line a baking tin with parchment. The original recipe called for an 18 cm/7 inch square cake tin. Pour your now liquid ingredients into the oats and mix well. Add the wet to the dry. Stir. 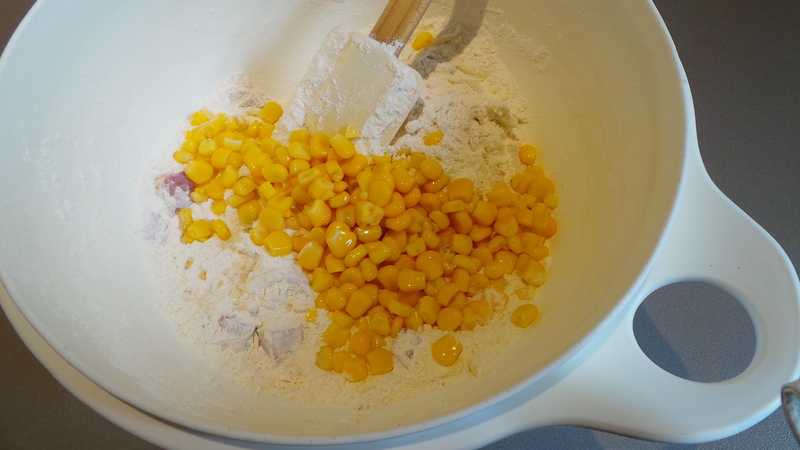 Press half this mixture into the base of your tin. Do NOT do what I did and use a silicon tray. You want the oats to crisp up and they just get soggy if you follow my example. Honestly. Now get a large cooking apple (around 250 g worth), peel it and slice it thinly. Arrange the apple slices in overlapping rows to cover the oat base. 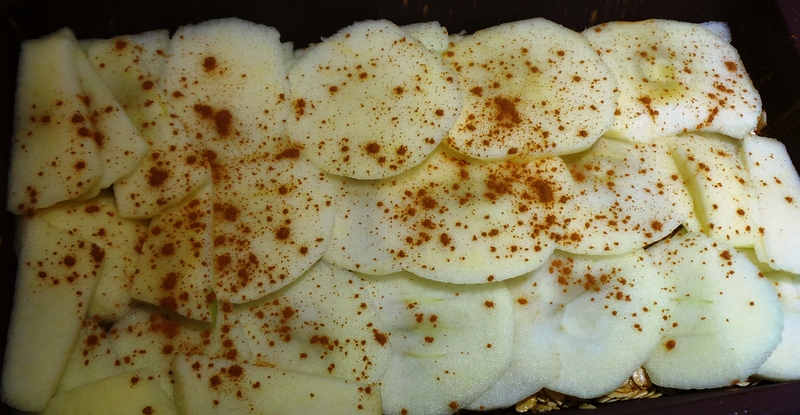 Cover your base with overlapping slices of apple. Sprinkle your slices with cinnamon. I was cooking for an adult who likes it, so I also used ground ginger on mine. Sprinkle with your choice of spice. 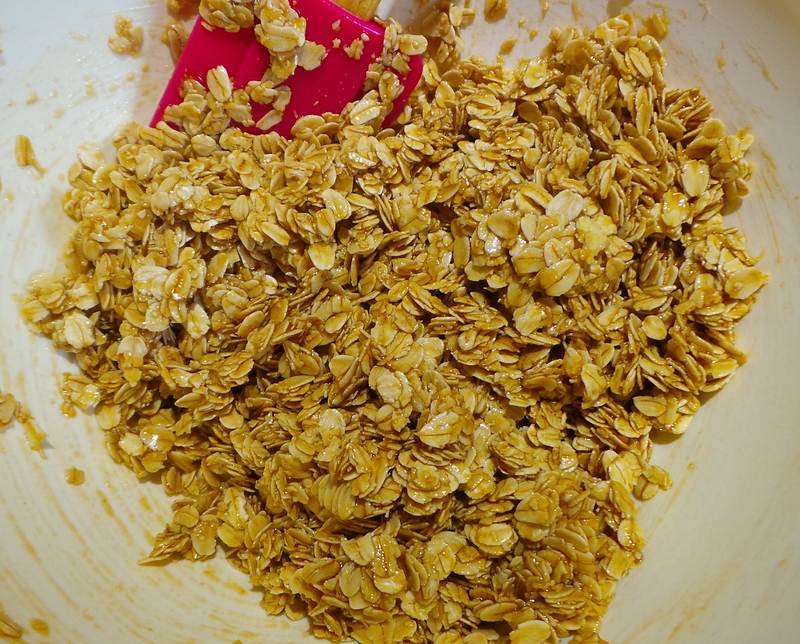 Top with the rest of the oats, press down firmly and bake for 30 to 40 minutes or until golden brown and crisp. Cut it into portions while still hot and in the pan. Leave in the tin to cool. You want your butter and honey to set before you try to move anything, or it will all fall apart. Store in an airtight container somewhere cool. Wrap in cling film and send as part of a school lunch, serve as an after school snack or use to accompany a much deserved cuppa. Heat oven to 190°C/ 375°F. 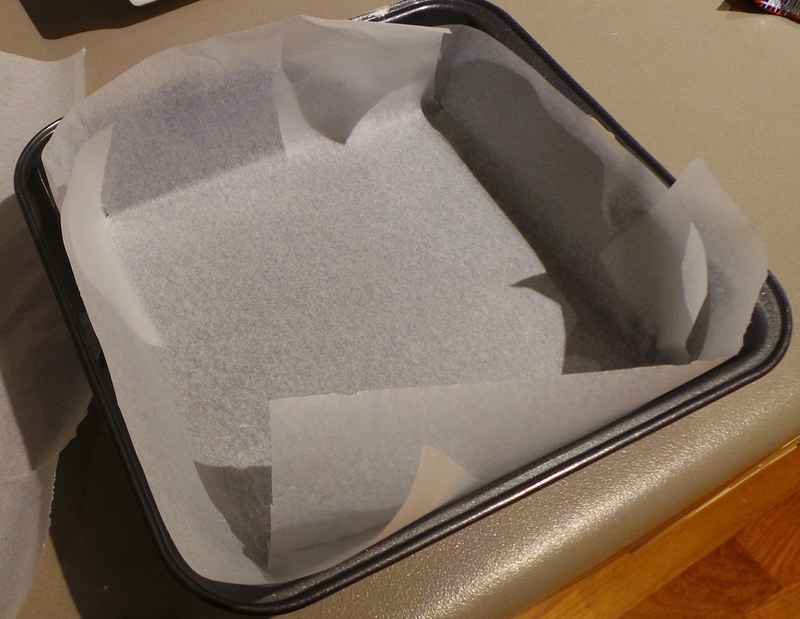 Lightly grease or line an 18 cm/ 7 inch square shallow baking tin. In a microwave proof jug or bowl, combine the first three ingredients and heat at 80% power for 1 minute intervals until melted. Stir together. This may be done in a small saucepan on the stove top if wished. 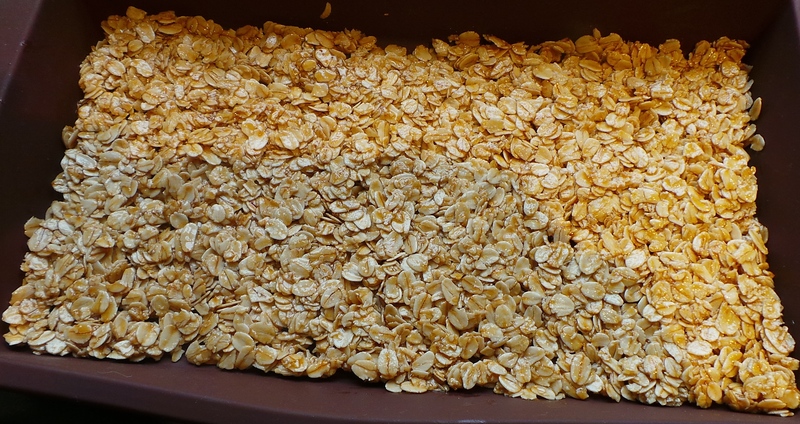 Measure the oats into a medium-sized bowl. Pour liquid ingredients over the oats and mix well. 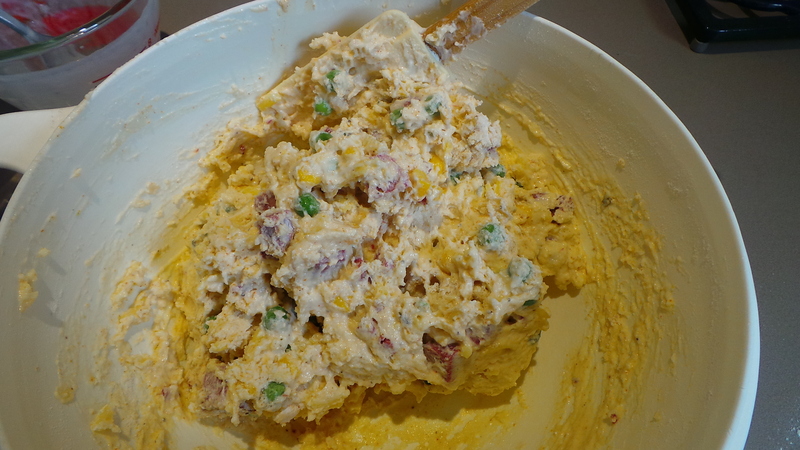 Divide the mixture in two and press half into the base of your prepared tin. 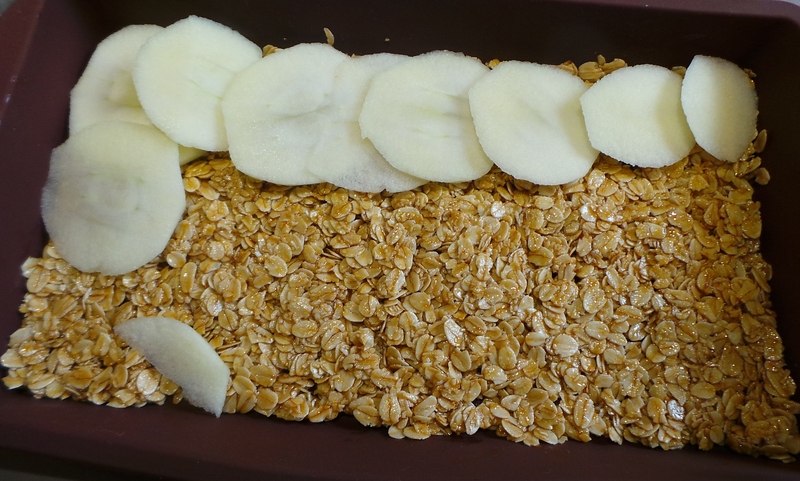 Arrange the sliced apple over the top of the oats in overlapping rows. Top with the remaining oats and press down gently. Bake for 30-40 minutes until golden brown and crisp. Cut into slices while still hot and then leave in the tin until cool. For a gluten-free version, substitute a gluten free muesli or granola mix for the rolled oats. Try using different spices for variety. A Pumpkin Pie spice mix might be just the thing for you. Sprinkle a handful of sultanas over with the cinnamon. Add a scattering of choc chips over the apple for a special treat. Okay. This is one of those recipes that builds on one you’ve seen here previously. It’s not difficult, but can be fiddly. 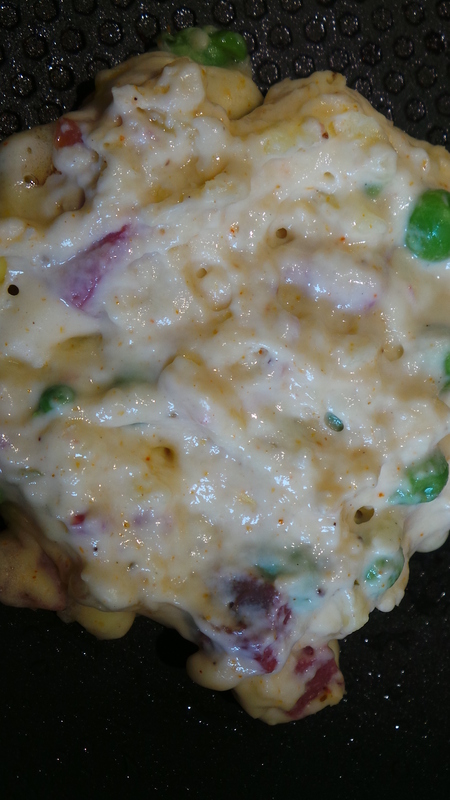 It’s certainly tasty and it can be as inexpensive as you want it to be. It starts with a basic scone dough (biscuits for Americans) and gets creative soon after. It’s perfect for those days when you want something more substantial for lunch. It’s great for getting the kids involved if they’re underfoot too. Also, if you have bits and bobs in the refrigerator that you want to use up, but which don’t really add up to a meal on their own…you know what I’m talking about. In other words this is more of a process than a recipe. Make yourself some scone dough but, instead of making it into scones, simply flatten it out into a vague rectangle shape. Use your hands and fingertips for this, there’s no need for a rolling pin. Try doing this on a little more silicon/baking/parchment paper sprinkled with flour. It will make rolling it up a little easier. Press your dough out lightly into a rectangle. The size of your rectangle will be determined by the thickness of your dough. Try to make it an even thickness all over – about 1 cm or ¼ inch. Try also not to make it too narrow a rectangle. You will be rolling it up and you want to fit a few turns into it! Turn your oven on and set it to 220°C/450°F. Spread your dough with a base flavouring. Tomato paste will work, as will pizza sauce. 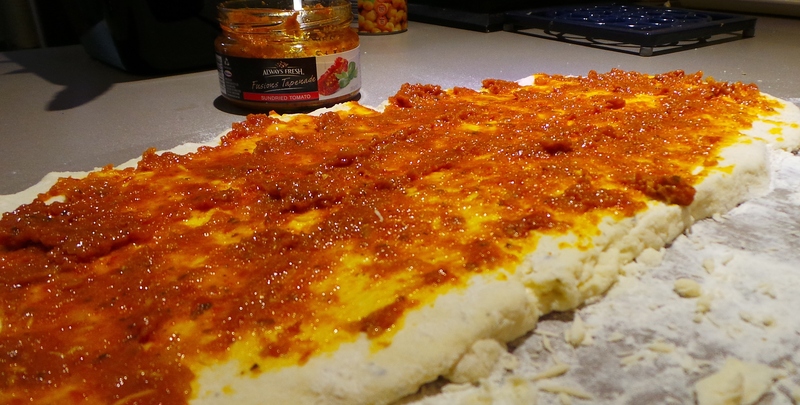 I find tomato-based spreads far too sweet for me and instead use a roasted capsicum spread called Ajvar that I was introduced to by some Macedonian friends (and now I’m hooked!) It’s something that is big among the former Yugoslavian nations, although I understand the Italians produce something similar – although I don’t know what it’s called. Spread your base with something tasty. You may use whatever you like. Basically you are simply adding a moist base for the rest of your fillings and ensuring that there will be no dry stretches of dough in the finished product. Try using barbecue sauce, basil pesto, olive tapenade or a chutney instead. You’ll find it much easier to spread if you use a spoon rather than a knife to spread it. Scoop it out onto the dough and then use the back of the spoon’s bowl to spread it. Now scatter with some grated/shredded cheese. Then get creative. This is where you can use the waifs and strays in your refrigerator. You won’t want to put too much on, or it will make the rolling process more difficult. 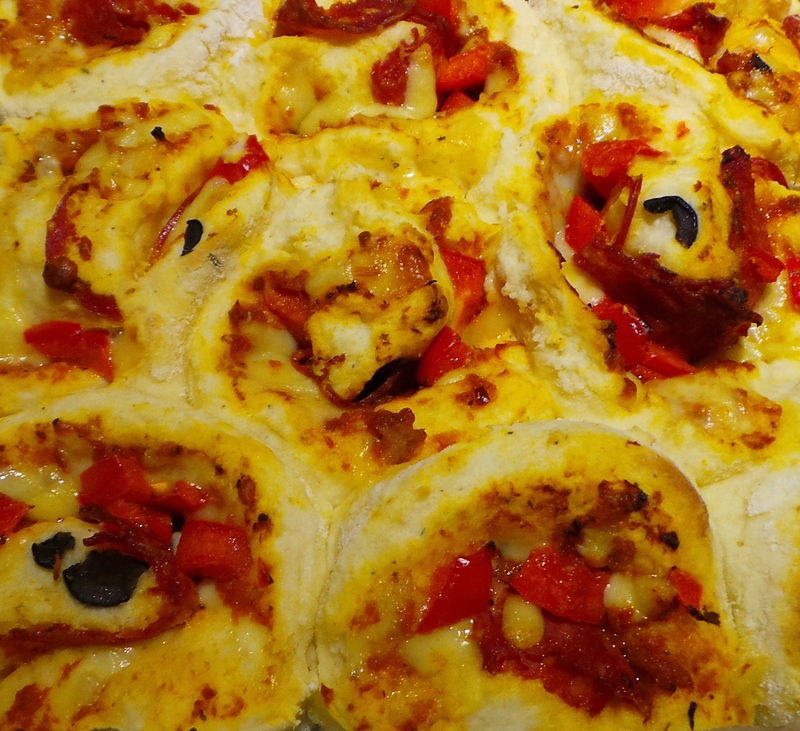 Add whatever you might add to a pizza: deli meats like salami or shredded ham, chop up a bacon rasher or two and scatter over, if you have some BBQ/rotisserie chicken in the fridge, dice it up and scatter it over. If you are vegetarian, try adding some chick peas/garbanzos or even some kidney beans. You won’t need much. Add whatever fillings tickle your fancy. Then add some diced vegetables, I’ve added capsicum/bell pepper in the photo above. Slice a mushroom or two, confetti it with sliced black olives or – and this is yummy – slowly fry some sliced onions or leeks in butter until soft and starting to caramelise, drain on paper towel and add generously. If you want to, at this stage you could just place it on a tray and bake it like a standard pizza. It will take 20 minutes at least. 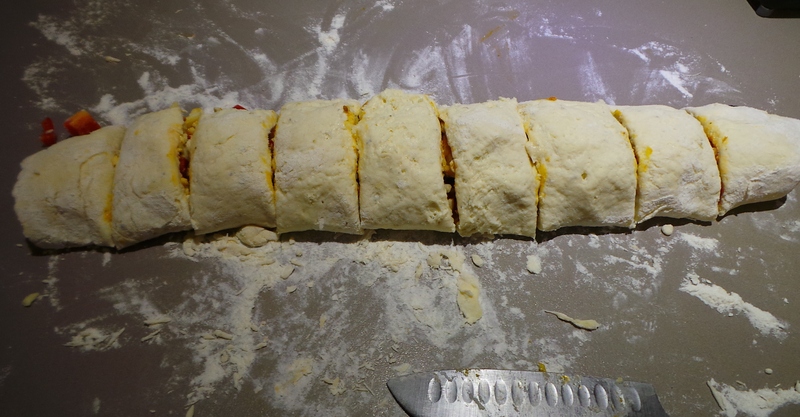 Or you can go on to roll it up like a Swiss Roll, lifting the long edge nearest to you and rolling away. Make it as tight as you can, but try not to put holes in the dough. If you have used a piece of paper beneath it, then use that to help you with the rolling. Some of your filling will inevitably escape from the long end or pop out the short ends. Don’t panic. Push them back in if you can, or consider them a Cook’s treat for while it all bakes. 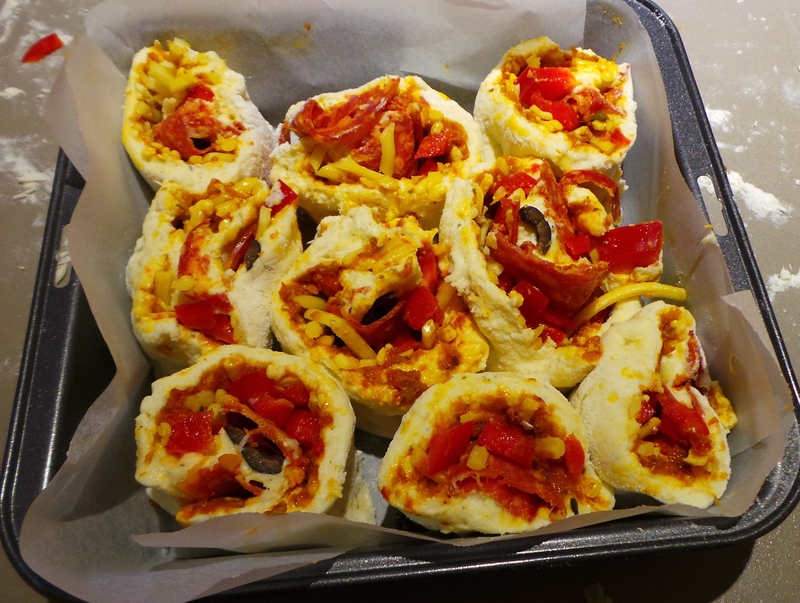 Roll it as tightly as you can, while still being gentle with the dough. Now transfer the pieces into your cake tin. Start in the middle and work your way outward in a daisy formation. Be sure to grip the open edge closed as you lift it. It will end up looking a bit like this. Place it in the top third of the oven and bake for 20 mins before rotating the tin and baking for another 20 mins. It will be done when a toothpick or skewer inserted in a doughy part in the centre comes out clean. You could sprinkle more cheese over the top at the half way mark if you wish. Lift it out and serve immediately for best results. Alternatively, wrap in a clean tea towel to cool, and it will be excellent cold for school lunches or a picnic. The cloth covering keeps the steam in and the quickbread soft. For a slightly crunchy variation, sprinkle some polenta or cornmeal on your surface before you start to press out your scone dough. Fritters are one of those magical things where you create a substantial meal from next to nothing. Flour, eggs, milk and those odds and sods cluttering up your fridge + a little time = happy tummies. My mother introduced me to the art of the fritter. When I was a kid, they were something that popped up on the school holiday or weekend lunch menu on a regular basis – especially during the long, rainy days that were the wet season in Far North Queensland (otherwise known as the Christmas Holidays). Easy, frugal and tasty they could be a part of your life too. You could even put your older kids to work making them during those long, wet-season holiday breaks. Picture a pancake. Your nice, thick fluffy pancake, not a crêpe. Then add in some of the bits and pieces. Fry. Add a dollop of your condiment of choice and Robert is your Mother’s brother. In our home, fritters inevitably contained either corned beef or hot dogs. In your home, they can contain whatever you want. Think rustic. Chunky pieces of whatever you have to hand. 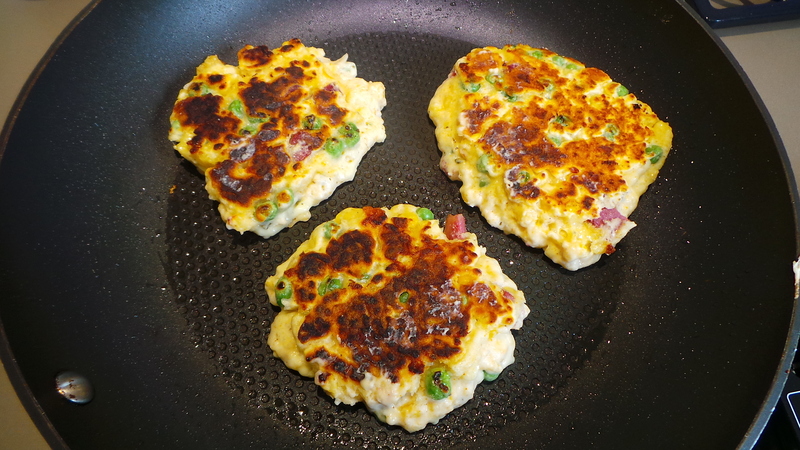 We had some leftover corned beef, so fritters came to mind due to my childhood association of the two. 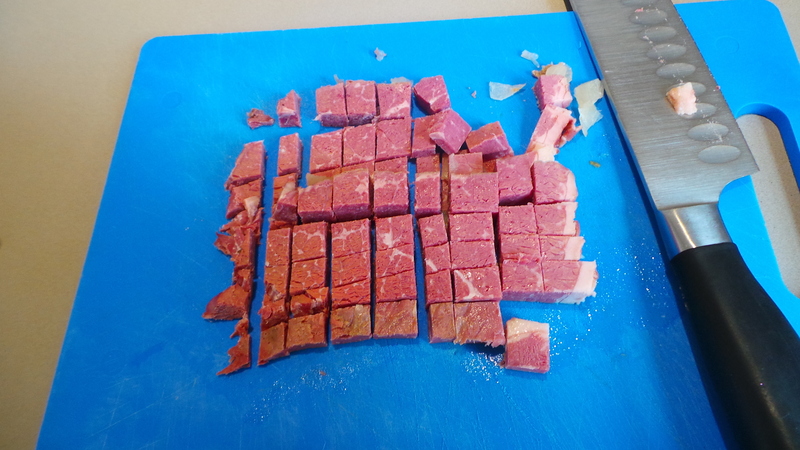 In our home it was always referred to as Cane-Cutters’ Ham, because my brother and I didn’t like corned beef….ahem. and it was all mixed together to form a stiff batter. So what to do with what could be considered a rather intimidating-looking mix? Introduce it in dollops of a tablespoon or so in size to a hot frying pan or skillet. Use the spoon to spread them a little, but don’t fuss too much. Start with smallish amounts until you are sure of the temperature of your pan. If the mixture sits there and no sizzling can be heard, then your pan is too cold. If it starts to smoke and you smell burning, then it’s too hot and you may as well dispose of that particular dollop. Don’t touch them until they are ready to be turned/flipped. If you try to move them before they are ready, you’ll end up with a mess in your pan and possibly in tears. 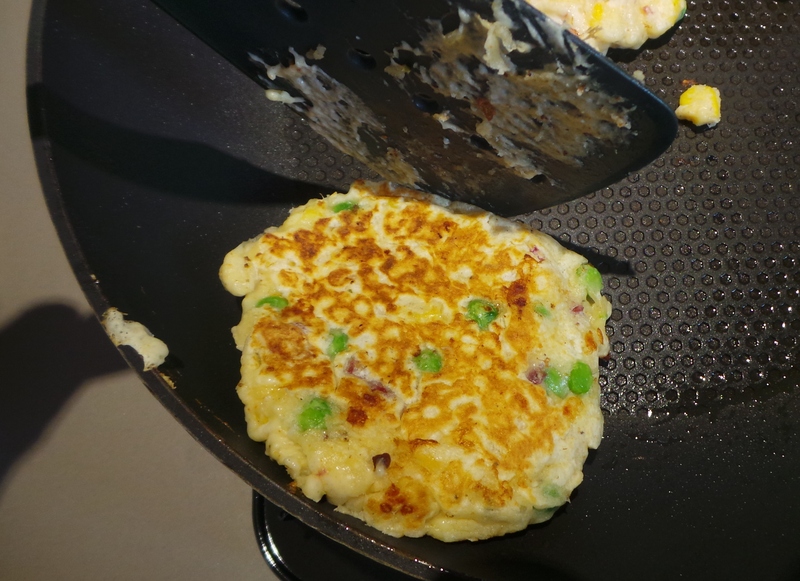 Using an egg flip/fish slice turn the fritters over and press gently on the top to flatten them a little more. 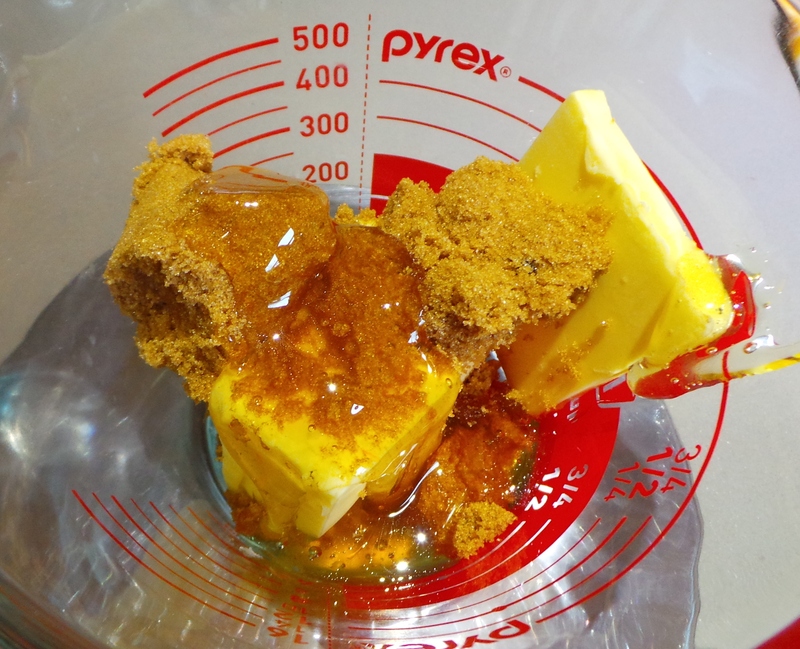 If you expose rather a large amount of uncooked batter when you press down, then don’t panic. Simply gently slide your fritter over to the edge of the fry pan with your egg slice, and hold the raw underside against the curved wall to cook it. 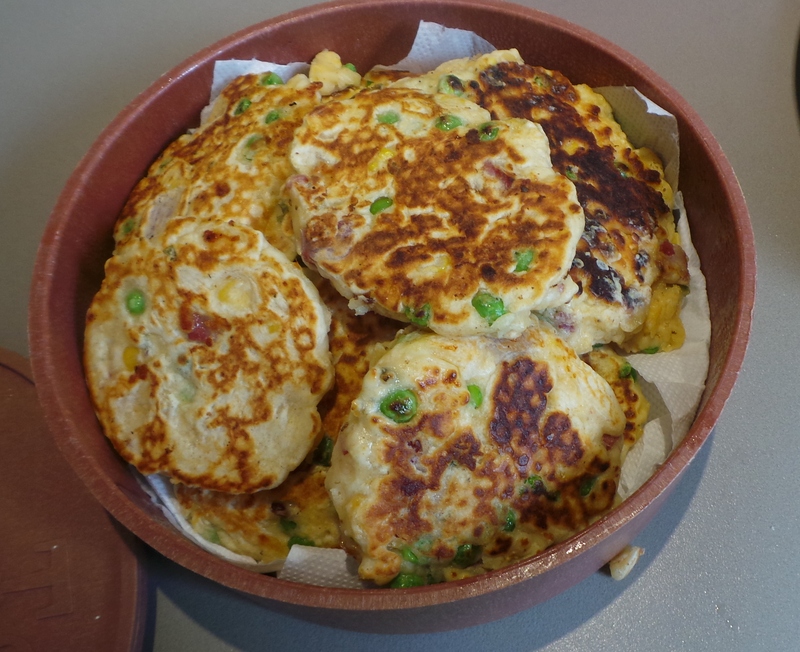 When the fritter is cooked through, you can either serve them immediately to the hungry hordes that will have gathered as the aroma of frying fritters grew (hyperbole? meh), place them on a paper-towel lined plate in a warm oven, or stow them in a tortilla warmer until they are all done. 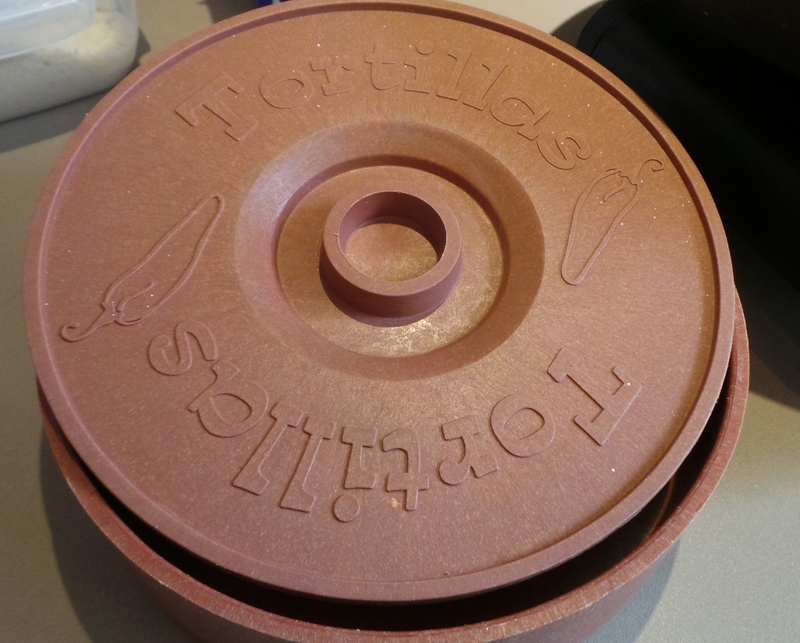 I have a tortilla warmer I bought in Walmart for about $3 during my Texan sojourn and it’s brilliant. They now pop up in Aldi’s once or twice a year in Australia and I heartily recommend them. Eat with your fingers and serve with a dipping sauce of some kind: ketchup, tomato sauce, mayonnaise, sweet chilli sauce, whatever. These are also great cold as a packed lunch/snack for school or long trips. Keep in an airtight container in the refrigerator for 3 or 4 days. 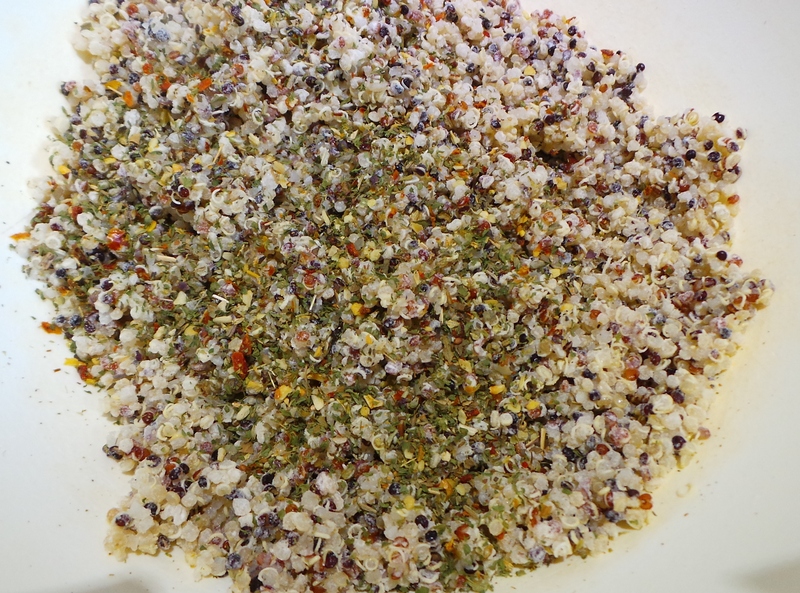 Seasoning of your choice: pepper, chilli flakes, mixed herbs, mustard powder etc or nothing at all. Your choice of meat: leftover roast meat, rotisserie chicken, hot dogs (try continental frankfurters for a treat), bacon, spam or even hard tofu and vegetables: peas, corn, onions, capsicums (peppers) mushrooms, grated carrots, celery, zucchini etc., cut into small dice. Three options should be sufficient, aim for a handful of each. 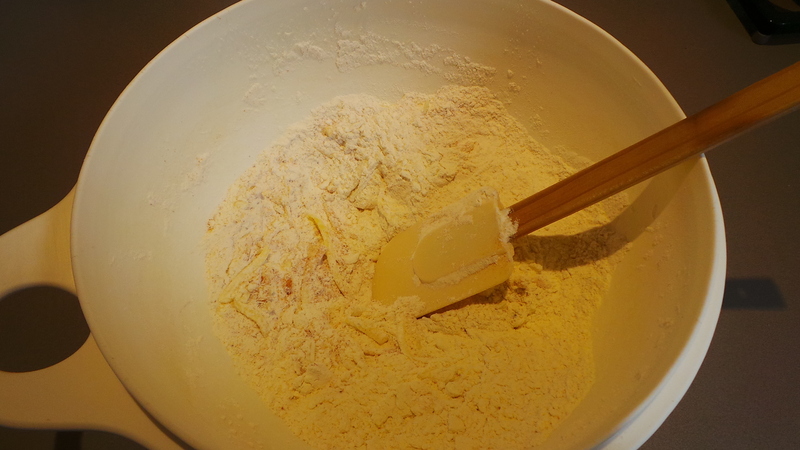 Sift flour, sugar and salt into a medium-sized bowl. If you wish to add herbs or spices, do so now. Stir in your cheese, meat and veges individually. 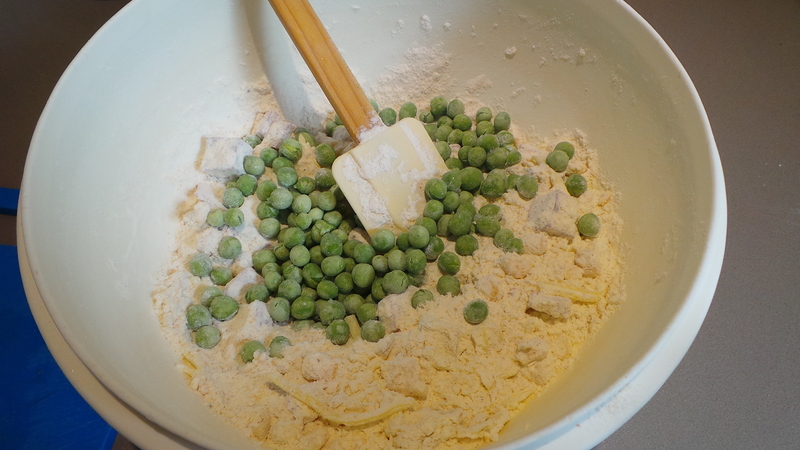 You will want each piece added to be coated in flour so that they will stick to the mixture. In another bowl or jug measure your milk, starting with the smaller amount. Add the egg and beat well with a fork. Make a well in your dry ingredients and add the liquid. Mix together with a wooden spoon or wide spatula until all ingredients are combined. Add more milk if necessary. This will form a firm batter. Heat a frying pan or skillet over medium heat, oiling lightly. 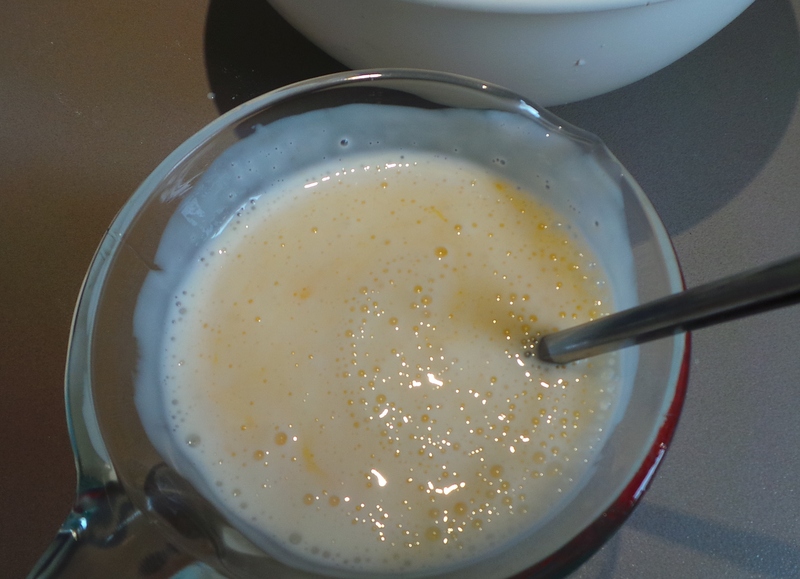 Add batter to pan in spoonfuls, turn only when small holes or bubbles appear in the surface. Cook for approximately 3 more minutes. Serve with a sauce of your choice.